Anemone virginiana. Gary P. Fleming.© 2014 Virginia Botanical Associates.vaplantatlas.org. (Accessed 3/2014). 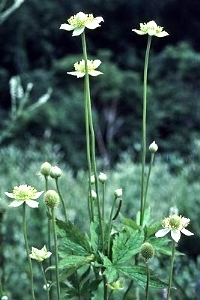 Anemone virginiana is a perennial herb to 1 m tall, from a root crown, stems hairy. Leaves along stem alternate, 2-3, palmately compound, segments egg-shaped, toothed or sharply lobed; 3 leaves whorled below inflorescence stalks. Flowers greenish-white, to 1.3 cm, 5 sepals, no petals, stamens numerous, on stalks, sometimes with a pair of leaves below flowers; July-Aug.
Fruit dry, a head of achenes to 3 cm long, achenes densely wooly. Habitat: Dry or open woods.